It’s July, it’s hot and it’s zucchini time. Once you’ve made zucchini bread, zucchini muffins, sautéed zucchini and zucchini and dip, then what? What do you do with an abundance of zucchini? Now you will make Megan’s Grilled Zucchini and love it! The other night my dear friend Megan, author of the food blog Woo-hoo Tofu!, invited my family to join her family for dinner. Everything she made was wonderful, we had brats and homemade kale chips and grilled sweet potato fries and broccoli salad, but one thing really stood out: the zucchini. In a word, it was amazing! Now, the thing you need to know is that while I like zucchini, I don’t love it. That was, until now. This recipe is so good that I even talked Megan out of some zucchini from our friend’s garden today so I could make it again for dinner tonight. (She’s taking care of our friends garden while they are on vacation.) You see, since I only liked zucchini before I haven’t planted it in my own garden for years. Now I’m kicking myself. I will definitely add that to my plan for next year! Slice zucchini in half lengthwise, then cut into 2 – 3 inch pieces. Brush zucchini with olive oil, then season with salt and pepper to taste. 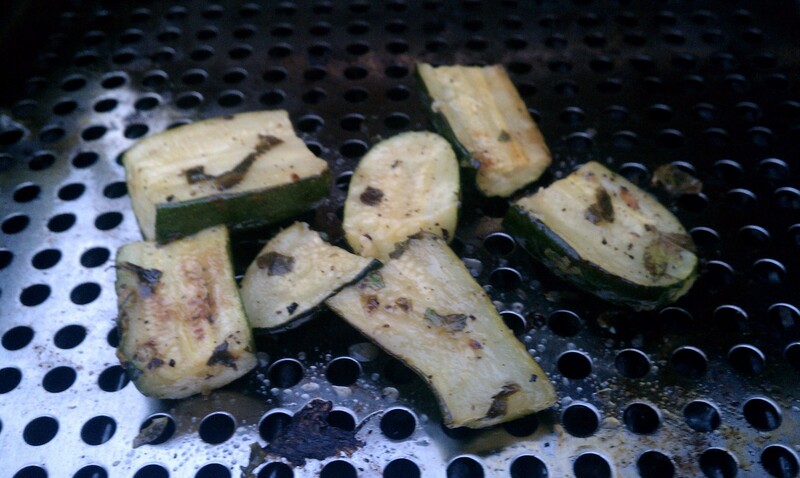 Grill zucchini for 7 – 10 minutes over high heat, flipping half-way through. Remove from grill and place in medium-sized bowl. Toss with mint and fresh lemon juice.